We’d love your help. Let us know what’s wrong with this preview of Shades by Esperanza M Cintron. Esperanza Cintr?n's Shades: Detroit Love Stories is a short story collection that is distinctly Detroit. By touching on a number of romantic and sexual encounters that span the historical and temporal spaces of the city, each of these interconnected stories examines the obstacles an individual faces and the choices he or she makes in order to cope and, hopefully, survive i Esperanza Cintr?n's Shades: Detroit Love Stories is a short story collection that is distinctly Detroit. By touching on a number of romantic and sexual encounters that span the historical and temporal spaces of the city, each of these interconnected stories examines the obstacles an individual faces and the choices he or she makes in order to cope and, hopefully, survive in the changing urban landscape. 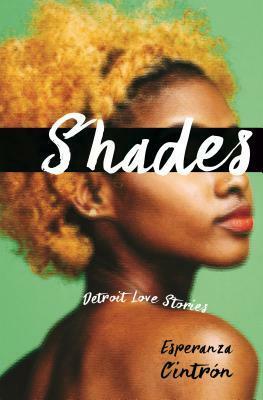 Shades begins in the 1960s by following two young black women who are determined to find joy in their lives even as they struggle to make ends meet. Their lives continue to evolve under triumphant and disappointing conditions-falling in and out of love, giving birth, raising children, and struggling to "make it" despite disappointing and tenuous love affairs and relationships. The setting throughout the eighteen stories shifts as these women age and their children extend the timeline, reflecting on the city's social and political changes over three decades, as well as the pitfalls, tragedies, and opportunities these linked families encounter. Cintr?n favors an everyday vernacular for her characters' voices in order to reflect the complexities of their working/middle-class, ethnic, and racial identities. Divided into two sections, Eastside and Westside, the collection gives a nod to the sometimes contentious geographical split marked by Woodward Avenue. Cintr?n takes readers through city streets-from neighborhood bars to burger joints-while painting lyrical portraits of the unique and multifaceted characters whose honesty shatters the illusion of endless love and happily-ever-after fantasies, as they clash with the circumstances of economics and race. To ask other readers questions about Shades, please sign up. In Esperanza Cintron's Shades, a collection of short stories examines the life of two women in Detroit. Belle and Margaret and their children face adversities in their everyday lives. These stories are intuitively written, painting a vivid, compelling picture of family, love, self-acceptance, sexuality, infidelity, colorism, harassment, drug abuse and loss. Cintron's use of the vernacular lends even more authenticity to each character's narrative allowing the reader the chance to relate. Divide In Esperanza Cintron's Shades, a collection of short stories examines the life of two women in Detroit. Belle and Margaret and their children face adversities in their everyday lives. Divided into two parts-Eastside and Westside Detroit, the differences and similarities faced by each character is haunting, as we are taken from the streets into bars, diners and clubs, all while getting just enough of a glimpse into each story to keep us wanting more.